These healthy sugar cookies are crisp on the outside and a little chewy inside, perfect consistency in my opinion. Whether you’re welcoming kids from school, baking a treat for Santa or enjoying the evening for yourself, these healthy sugar cookies are just right. Only 4 simple ingredients are needed. I used almond flour because it is naturally sweeter than whole wheat flour, a great way to cook with limited carbs and tastes great! My 8 y.o. helped me prep and bake them. Both of my kids and hubby loved the cookies. Few other batches that I baked later, I tweaked them and you can add raisins, dried cranberries, chocolate chips and almonds or pecans, so feel free to give them a try as well. Please save this photo-pin below (Pinterest-friendly pin). If you’re not making these cookies right now, it will be easy to find later. Place large rounded tablespoon onto baking sheet, about 1 inch apart. Flatten slightly. 150 cal per cookie. This is based on 12 cookies and regular brown sugar. If you substitute with granulated sweetener of your choice, your macros may be lower: 9g carb, 4g sugar, 11g fat, 5g protein, 25mg potassium. This is calculated without chocolate chips or nuts being added. To avoid almond flour while still enjoy the cookies low carb, you can sub for Carbquik baking mix or Caulipower baking mix. Let me know what do you think and if you enjoyed them? 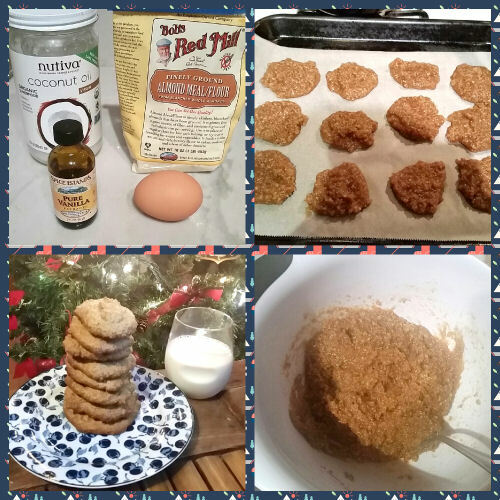 Please feel free to share this recipe with the people that you think would enjoy these healthy sugar cookies. Handy printable is below. Happy Holidays! The cookies look delicious. You might try adding dried cranberries along with the raisins and chocolate chips. We are going to try these w Victoria tonight. She wants to add choc chips and I’ll be adding raisins. Any idea on the nutritional information for these? I’d love to know the end carb count per serving. Thank you!! I can’t wait to try the cloud bread. Also looking forward to your amazing recipes. What is the nutritional facts on the sugar cookie? These look amazing and I am so glad the carb info is posted.